This church literally has a storybook name – in 2008 Charleston-based author Ken Burger published a book titled Swallow Savannah set in a fictional place near the Savannah River, similar to the town of Allendale. Swallow Savannah Methodist Church, however, tells a different story, and is perhaps one of South Carolina’s oldest Methodist churches. It is likely that the first Methodist preacher to reach this area was Thomas Darby, who came to South Carolina as a chaplain for the British during the Revolutionary War. He remained after the war, preaching in his territory, which included the Georgia Conference. Possibly as a result of Darby’s influence in the area, Swallow Savannah Church was formed. The church initially was a log structure built in 1815 about 700 yards northeast of a body of water known as the Swallow Savannah Pond in a rural area near present-day Allendale, giving the church its name. 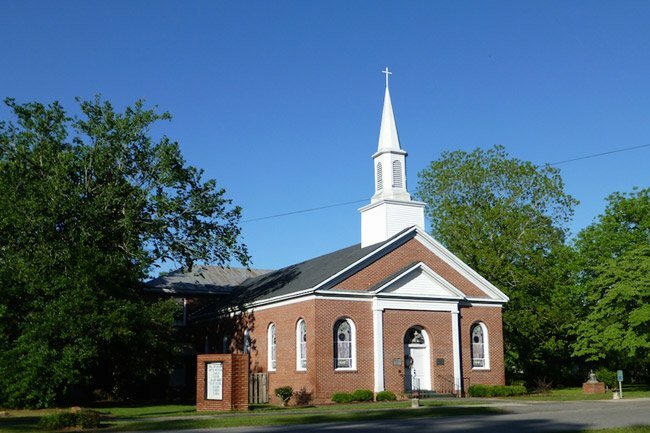 The church moved to three different nearby locations over the years before relocating to downtown Allendale as a result of the new Augusta and Port Royal Railroad, which brought more people to the town. The congregation built a structure on the site of what is now the Allendale Cemetery before moving to its current location on land donated by Lawrence Williams. Williams gave the land to the church with the provision that the church always retain the name Swallow Savannah Church. The congregation met in Union Church, a nondenominational church that allowed different churches to meet in its building on a rotating schedule, while its new church was under construction. Finally in the late 1800s a “large white wooden structure” was completed on the present site. Today a brick church welcomes worshipers under its original name of Swallow Savannah Methodist Church. If anyone has any further details on Swallow Savannah Church, please share it with us! We are sorry to hear of your loss, the best bet would be perhaps getting in touch with the church of the same name at this phone number (803) 584-2363 (found on Google) to see if they have information on who maintains the cemetery grounds. We hope this helps! Whom do I contact regarding maintenance of a grave at Swallow Savannah Cemetery. My children and I will be visiting there in March in order to leave my late husband’s ashes. His parents were Major Woodward Allen and Frances Allen, buried in that cemetery. Two corrections on Swallow Savannah Methodist Church. The correct names of the individual who donated the land was James Lawrence Williams. The second is that the church could use the land unless they planned to move the church and sell the land, then the land was to be given back to the Williams Family.